Everyone should be familiar with the ubiquitous chilli plant, in particular the Capsicum chinense varieties which are well known for their exceptional heat. Although chilli peppers have been selectively bred and under cultivation for at least 7500 BCE, they still retain their 'parent plants' perennial growth cycle. Therefore when grown in frost-free climates, the chilli plant is quite capable of growing into a large perennial shrub and producing a viable crop for several seasons. Of course chilli pepper plants are grown as an annual crop in northern European climates as they have little tolerance to cold damage. However when grown under a protected environment they can go on to produce their crop year after year, avoiding the need to purchase replacement plants the following season and waiting for them to grow to a size where they will begin fruiting. Be that as it may, Capsicum annuum cultivars do not overwinter particularly well, even when grown in heated greenhouses and so these are still best grown as an annual crop. Capsicum frutescens and Capsicum chinense cultivars (which include the popular Hab, Scotch Bonnets and Naga chillies) can also be a bit 'hit and miss' when overwintered, however excellent results can be achieve with Capsicum pubescens and Capsicum baccatum cultivars. When night temperatures begin to fall to below 8-10 degrees it will be time to start preparing your plants for the winter. This will around the end of October, but you will need to keep an eye on your local weather forecast. You can increase the chances of your plants surviving the winter by giving them a severe pruning back as the winter closes in, only leaving about 10-15cm of the main stem. This prevents the chilli plant from wasting energy maintaining foliage or fruit which would otherwise leave it in a weaker condition to survive the cold. 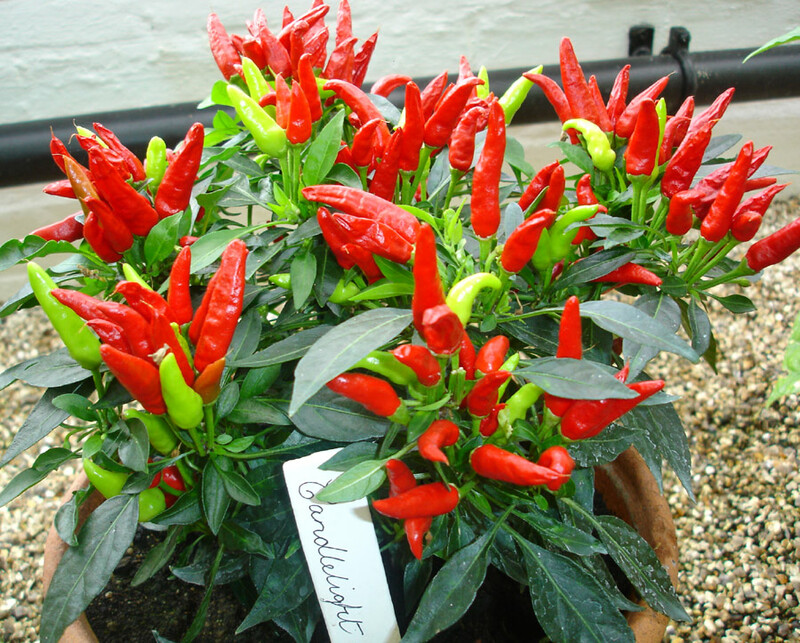 You can also consider repotting your chilli plants into larger pots. The additional compost will act as cold insulation for the roots as well as providing fresh nutrients for the spring flush of growth. For best overwintering results the plants should be grown in individual pots though this will result in a lower crop compared to plants grown directly in the ground. 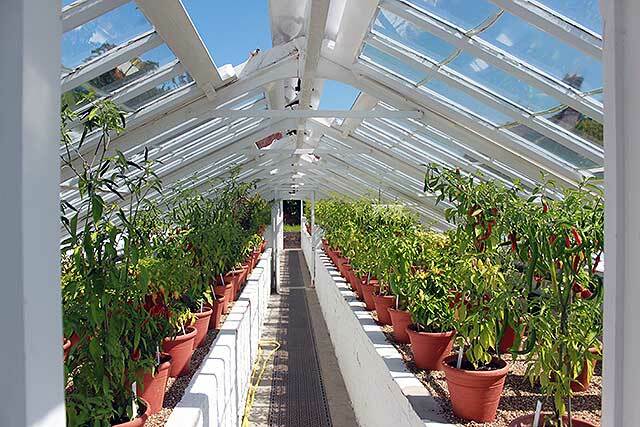 To make the most of our comparatively shorter growing season, field-grown chilli pepper plants are usually grown within the protection of an unheated greenhouse or more likely a polytunnel. In this instance provide a secondary tent or cloche-like level of protection using heavy duty bubble-wrap or fleece. 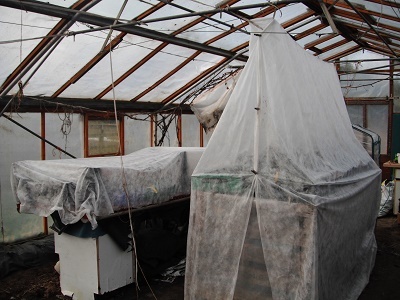 Pot grown plants which again would normally be cultivated within a an unheated greenhouse or polytunnel will need to be raised off the ground onto benches. If an integral heating system is not in place then consider using either paraffin heaters or heat-mats. If an integral heating system is in place than maintain a temperature of between 5-7 degrees Celsius. If you are only growing a few plants then you may be better off bringing them indoors to a sunny windowsill. If the room is unheated such as a conservatory then place a piece of perspex or thick card between the window and the plant to protect against frost damage in severe winters. Avoid cold draughts and do not leave behind curtains. Be aware that the lower temperatures and light levels of winter will cause your chilli plants to fall into a period of dormancy. This is identified by a sharp reduction in growth and for a long period of time the plant may look as though it has died. During this period there is no need to feed, and watering must be kept to a minimum. At this time of year water will only need to be applied once every two to three weeks, and avoid waterlogging. Once conditions improve the following spring you can expect your plant to bounce back into new growth.